I recently had the opportunity to see a confidential, 22-minute completion fundraising preview of C. J. Hunt’s documentary, In Search of the Perfect Human Diet, and I can tell you that this is going to make waves. He’s done a fantastic piece of investigative journalism that leaves no doubt about which diet is the best match for the human genome. This is the scientific evidence that the world, especially the media, needs to see in order to find solutions for the epidemic of obesity and chronic diseases that threaten our well-being and our very survival, both individually and as a society. In Search of the Perfect Human Diet reminded me of something I have puzzled over since 2004 when my husband was working on a project that took us to Greece. 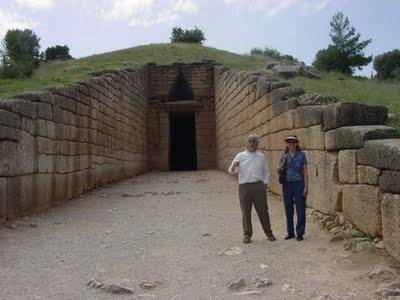 The first picture at the top of this post shows me with our Greek friend and host at the entrance to a beehive tomb in Mycenae. The hill behind us is really a huge stone dome built without interior supports. Notice the size of the stones in the entry walls, with the largest stones at the bottom, becoming smaller toward the top. The second picture, with my husband standing in the same spot, gives you a better idea of the scale of one of the stones. 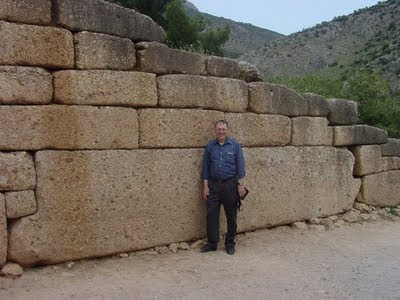 The 2nd Century Roman geographer, Pausanias, described the walls as being made of stones, “so big that a pair of mules could not move the smallest from its place in the slightest degree.” The Greeks called them Cyclopean walls, because they thought they could only have been built by giants. (Cyclops were a mythological race of one-eyed giants.) Some modern writers cite them as proof that the Earth has been visited by aliens. Similar walls are found in other places in Greece and Italy and at Machu Picchu and other pre-Columbian sites in the New World. How did these primitive people, on the cusp of the change from hunter-gatherer to an agricultural lifestyle, accomplish such feats? Writing had not yet been invented, or at least not to our knowledge, so we don’t know. But scientists and anthropologists can tell us what they ate and the affect that a radical change in diet had on future generations. We tend to view history as a one-way street of progress with ourselves at the pinnacle of human achievement. Perhaps these early people were really much smarter than we give them credit for. Perhaps they were also stronger, healthier, and better looking than we are. I wonder what we could have accomplished by now if we had not traded our birthright for bread and sugar. Egytian pyramids, Giants, Greece, Lascaux cave paintings, Sphinx, The Perfect Hman Diet. Bookmark. Um, what does he mean he's surprised that "we made it"? The story is far from over, and I truly believe that if something doesn't change, we will NOT "make it". "C. J. is hoping to get his 4-part documentary edited and on HBO, the Discovery Channel, or PBS by January 2009." Should that be January 2010, or is this from an old post? Fixed it! Thanks for catching my mistake.